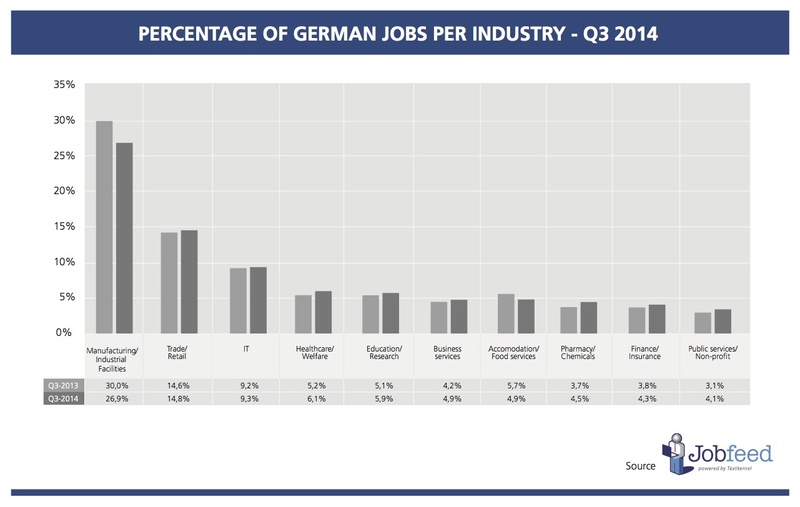 Today Jobfeed publishes its Q3 – 2014 index on the German online job market. This index is based on the analysis of more than 2.8 million job postings (more than 1.1 million unique jobs after deduplication) published in the third quarter of 2014 in Germany and collected by Jobfeed. Jobfeed is Textkernel’s Big Data tool for jobs that collects and categorises all online jobs in Germany into a searchable database. 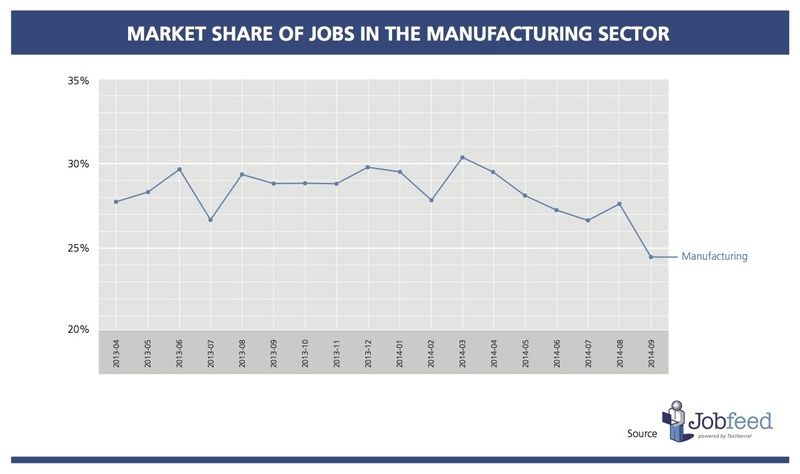 The manufacturing sector remains the main employer in Germany despite a steep decrease (-2.9% ) of its share compared to the last quarter (see Jobfeed Index Q2). This trend reflects the largest plunge in manufacturing orders Germany has ever experienced since 2009*. Other sector of the German economy remain somewhat stable with variations comprised between -1% and +1%. 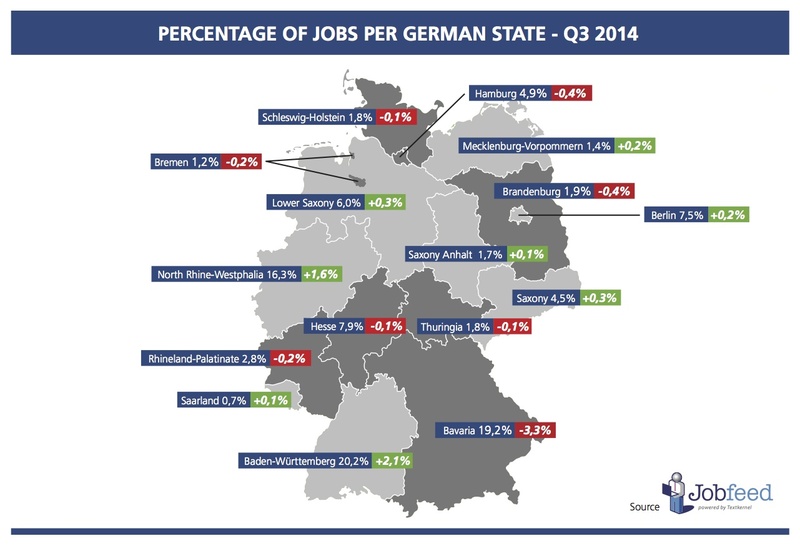 With a 2.1% increase compared to Q3 2013, Baden-Württemberg becomes the largest employment area in Germany representing 20.2% of all jobs published online. It has overtaken Bavaria that lost 3,3% market share compared to last year. Continuing its plunge with a 2.1% decrease from last quarter, it has relegated to second place. North Rhine-Westphalia consolidates its third position by an increase of 1.6% in share of the online job market compared to 2013. 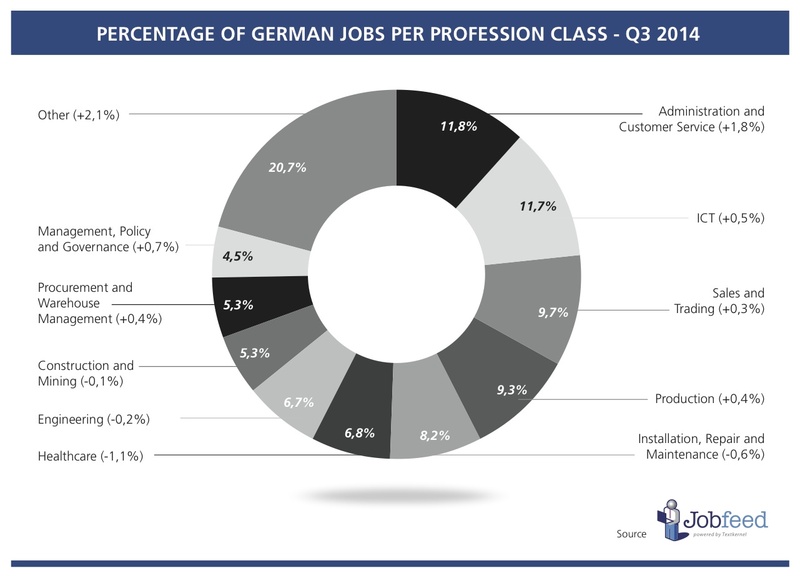 With an increase of 1.8% over a year and 0.4 % compared to the last quarter, “Administration and Customer Service ” has become the main profession class in Germany in Q3. IT, that also increased in market market share, steps back to the second place. Online jobs within the Healthcare and Education and Training professions have decreased 1.1% and 1.4% respectively. The Management, Policy and Government profession class registered the second biggest increase up 0.7% compared to last year. This index is also available for the French and Dutch market. Learn more about how Jobfeed works.